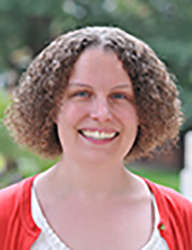 Erin George is Assistant Professor of Economics at Hood College. In this post she talks about her experience incorporating Wikipedia into her course on Environmental Economics. Image: Erin George 2.jpg, by Joann Lee, CC BY-SA 4.0, via Wikimedia Commons. At the heart of environmental economics is the study of pollution. Economists define pollution as a negative externality, the negative spillovers of a transaction that harm individuals who were neither the buyer nor the seller in a transaction. A classic example of a negative externality is second hand smoke. Since environmental economics is chiefly concerned with these negative effects on third parties, I decided to create a series of class activities that do the opposite wherein students provide a service with positive externalities. A positive externality is an action that creates a benefit to third parties beyond those engaged in a transaction. In my environmental economics course for the past three years, students have been involved in two assignments that focus on providing a positive benefit to their local and global communities: (1) a local service learning group project and (2) an individual creation or expansion of a Wikipedia page. The course consists of students, sophomores to seniors, from a variety of academic disciplines: economics majors and minors, business majors taking the course as an elective, environmental science and policy majors, and occasionally students from other majors, such as political science, taking the course as an elective. Thus, students enter the class with a wide variation of knowledge about both the environment and economics. Tackling the development of a Wikipedia page allows students to highlight their particular strengths and interests; students with political science and policy interests tend to edit pages on policies and treaties, students from other countries more often edit pages of greater interest to their home localities, and economics students tend to focus on environmental economic theories. In the past years, students created and expanded pages on a wide variety of topics: the environment of Bosnia and Herzegovina, the environment of Pennsylvania, locally unwanted land uses, material efficiency, groundwater banking, the genuine progress indicator, conservation finance, and the Minamata Convention on Mercury. They exceeded my goal of giving back their knowledge to the greater community. The assignment stretches over the course of the semester in many small assignments, where students learn the technical side of Wikipedia and the basics of writing with a neutral point of view. Having students write in Wikipedia requires delving deep into a topic, enhancing understanding of that topic. At the same time, writing in Wikipedia teaches the basics of markup, so that students are introduced to some tools that they may not otherwise be exposed to. Wikipedia’s Visual Editor is exceedingly easy to use to update pages, so that even students who are initially hesitant are able to successfully edit their own pages. I have used Wiki Education’s training resources for educators to a great extent and find them helpful in creating the assignment and in navigating Wikipedia with students. In a bit of juxtaposition, the main difficulties in running the project turned out to be some of the most profound learning experiences for students. Several students struggled to come up with a topic that was notable with verifiable research in reliable sources and that did not already have a lot of information on it. While I introduced students to the stub pages on Wikipedia, many had difficulty in identifying a stub page where there was enough well-sourced documentation to add value. Several students ended up changing topics during the semester. This was probably the most difficult part of the project. As an educator, perhaps the most enriching part of using Wikipedia is watching students take pride in their pages and exhibit more excitement about writing for Wikipedia than they ever do in writing a term paper. While there is always some pushback because the assignment is unusual, I have enjoyed utilizing it in my course. In a class that otherwise focuses on so many negatives (negative externalities, the negative effects of pollution and environmental degradation), students see how their contributions to the commons has a positive impact on the world around them. Students making positive externalities out of their work on negative externalities? Check.